Ordering the replacement windows is fairly straight forward if you know what dimensions you’ll need. You need to measure the height and width of the existing window opening. 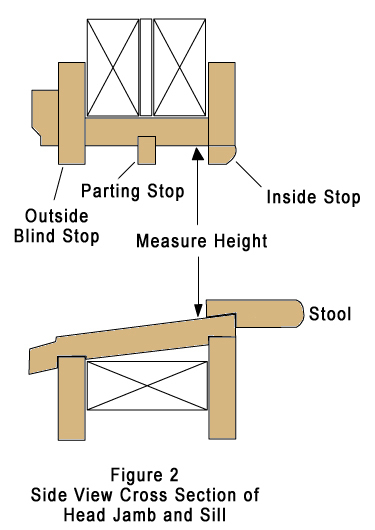 Step 1 – Measure Width: First you need to measure the width of the window. See Figure 1 which shows how to measure the width of the unit between the left and right jambs. If your house had replacement windows previously then it’s likely you’ll have a plastic or aluminum jamb liner where the parting stop and jamb are shown in the photo above. Later in the article I’ll show a photo of a that jamb liner. I bring this up because the jamb liner is typically about 3/8 to 1/2 inch thick and you need to base your width on the fact that the jamb liner will be removed. Once you’ve measured the width shown above you’ll want to order the replacement window approximately 1/4 inch narrower (each manufacturer actually recommends how much narrower to use). Step 2 – Measure Height: Next you need to measure the height of the replacement window. Most (but not all) existing windows will have a sloped sill. This is important to note because you want to be sure to measure the “least” opening which occurs at the top of the sill. See Figure 2 for a sketch on how to measure the height. Again you’ll want to take the vertical measurement and subtract about 1/4 inch for the height you’ll order. Be sure to check with the window manufacturer on the recommended size tolerance to use. Step 3 – Unit Depth: The last dimension you need to check is the distance between the outside blind stop and the inside stops. 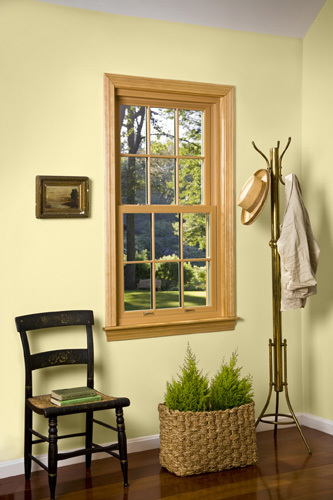 Most older windows were built with a dimension of 3-1/4 inches to 3-1/2 inches. 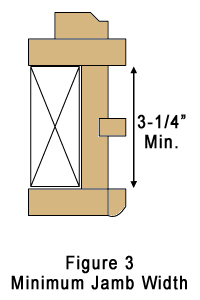 In order for standard replacement windows to fit you need a minimum distance of 3-1/4 inches (see figure 3). Not everyone agrees that replacement windows are necessarily more efficient. A properly sealed and maintained wood window with a properly installed storm can in some cases provide more protection. This is not to mention the fact that older wooden windows, when properly maintained or refurbished, will far outlast any window on the market today. Many of them have already weathered a century or more and if kept properly maintained will outlive their owners. I totally disagree, I have installed 1000’s ow windows and none of the wood windows can even match the performance and quality of a higher grade vinyl window for energy savings, sealings and ease of use. I work in a glass plant that produces loE window coatings. Old non coated windows are not nearly as good as new energy efficient windows. Anybody who tells you otherwise does not know what they are talking about. DO THEY MAKE REPLACEMENT VINYL WINDOWS WITH A JAMB DEPTH OF 3-1/4 , I ORDERED SOME FOR MY HOUSE AND THE WINDOW WAS ABOUT 1/2 ” SHORT , BECAUSE NEW WINDOW HAD A JAMB DEPTH OF 2-1/4, MAKING THE WINDOW SIT LOWER ON SLOPED SILL, I JUST HAD TO ADD A PIECE OF TRIM OUTSIDE TO FIX,PROBLEM. It’s not uncommon to have to make new jamb stops and trim. Replacement windows almost never match the original window dimensions. To your direct question, yes there are windows that have a frame depth of 3.25″. These windows are built to meet the requirement for most replacement projects. I am not suggesting you bought an inexpensive window, but if one shops strickly on price then it is highly possible that there was a less expensive window that looked great, but close examination, or explanation by the sales person selling the window, could show that the savings was accomplished by a lighter (both wall thickness and frame depth) window. This also results in thinner glass units which affects thermal properties as well as sound transmission. It is prehaps to late for this to help you as it sounds like this is an after the fact question, but possibly can help someone in the future. I have searched far and wide and still cannot find a simple explanation of how to measure for replacement windows on a block house in florida every article seems to reference wood frame and none of the articles explain whether to measure from outside block to block or inside drywall to drywall ?? Rich – What you need is some sort of “wood” buck typically that’s attached to the block, and then the window attaches to that. Best way is to expose the block on one window so you know for sure what’s there. Good evening, great article, but I have a question what is the proper way to measure for replacing an existing replacement window? since it is on solid plastic jam 3/8-1/2″ thick. Do you add on both sides, subtract or combination of both. Best explanation I’ve seen in searching for 3 days on google and You tube. Thanks! By reading others comments, it’s obvious you can’t answer every possible scenario with one explanation, but with this page, you have covered most windows in America I believe!